Createspace Independent Publishing Platform, 9781461032779, 280pp. 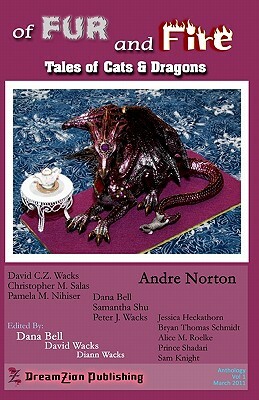 This collection contains Fantasy, Science Fiction, Horror, and even some humor. From the classic Andre Norton's "All Cats Are Gray" to the next generation of authors, we collected an interesting assortment of stories, poems, and images for you to enjoy. Inside you will find cats, dragons and even the occasional co-mingling of the two. Be warned They are not always what they seem. DreamZion Publishing is a small press house dedicated to promoting and marketing new Authors, Artists, Poets, and Photographers. We do not restrict genres. Our only criterion is quality. We run several anthologies throughout the year and are always looking for new submissions. We are located in Colorado Springs, CO and attend multiple conventions and events each year to promote the books and authors. The Meaning of DreamZion DreamZion is a concatenation of the words Dream and Zion Dream(dri: m) - n * a cherished hope; ambition; aspiration Zion(\Zi"on\) - n * an imaginary place considered to be perfect or ideal [syn: Utopia, Sion] So DreamZion is the aspiration to the perfect or ideal!